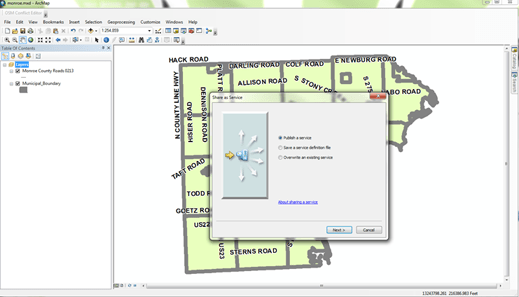 Offline ArcGIS Asset Management. Really? How much does ArcGIS Online REALLY Cost? 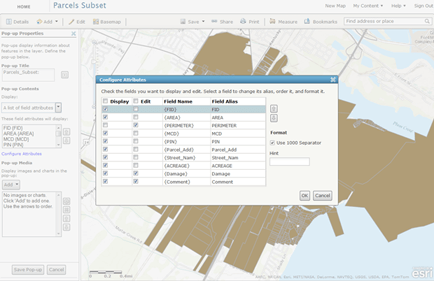 Building your ArcGIS runway. Huh? Matt holds an MSc in Geography and GIS. He has been working with clients solving problems with GIS for over 17 years. Matt founded WebMapSolutions whose mission is to put innovative, intuitive GIS driven applications into the hands of new and existing users. Disaster management demands rapid response, and careful coordination of workers in the field. Mobile technology has the potential to provide important tools to first responders to help mitigate the effects of disasters. Working with a county in the state of Michigan, we have been investigating the use is iOS and Android devices in combination with ArcGIS Online to help improve disaster management efforts. Over the last few years there have been an increasing number of tornadoes and floods causing considerable damage in Michigan. An important requirement of many county GIS departments, often with help from the Red Cross, is to quickly record damage and report findings to State authorities to then provide funding and assistance. 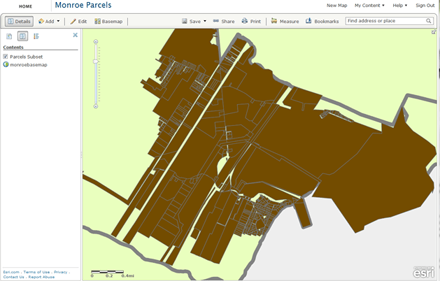 Field workers are sent out to affected areas with parcel maps. Notes are made parcel by parcel on level of damage, often home owners are interviewed. Once back in the office this data is collated and assembled in a spreadsheet and emailed to the State. This represents a labor intensive effort under considerable time pressure. Mobile technology in combination with the cloud, have the potential to dramatically improve the efficiency and reduce the effort required in managing disasters. We were asked to investigate the use of tablets as disaster management tools; a mobile ArcGIS Online app which uses both onboard GPS and camera, to collect and report levels of damage. The app needed to work in both connected and disconnected modes. We’ve been building a mobile app framework which provides both online and offline functionality. We took this framework and adapted it for the disaster management requirements. 2) A tiled base layer based on a layer package (.lpk file) for an online base map. 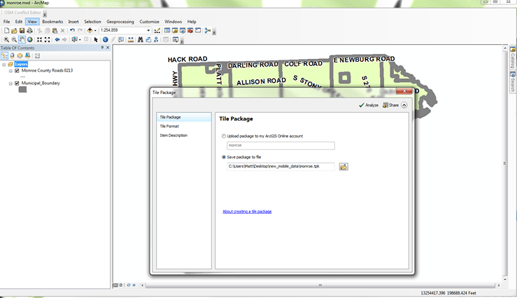 Next we published an editable hosted feature service in ArcGIS Online. In our case we made some edits to the attributes of the shapefile and added two field (damage level, and comments) before publishing. 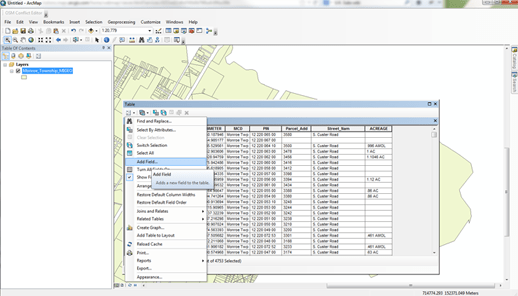 In each case above the data needed to be in a Web Mercator projection which is the default for ArcGIS Online. Another point worth mention is that ArcGIS Online at present only supports 1000 features, so shapefiles with more than this number of features cannot be published as hosted feature services. We will revisit this topic in due course. Now our interest is only editing certain attributes. Though we do wish to see all attributes in non-edit mode, when in edit mode it would be nice to only list these editable fields. In ArcGIS Online when we view the hosted feature service, we can open the ‘Configure Pop Ups’ option and set only those attributes we wish to edit as visible. Perfect. But alas not, this filter only applies in the web interface and not what is passed to the mobile app. After successfully publishing and configuring the services, we then combined the published tiled basemap and hosted feature service as a single web map. 3) A Web map which combines the above two services. 2) Is configurable meaning the UI can be altered without need for a developer and recompiling. 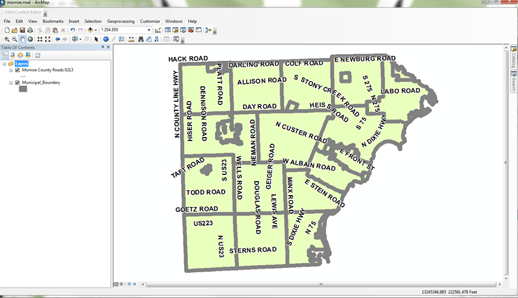 3) Is flexible such that users can switch the web map loaded and ArcGIS Online account used. The configuration file is a key element, providing maximum flexibility. This file, like the tpk, is copied to the device. And is read each time the application loads. The 1000 feature limit in ArcGIS Online hosted feature service we mentioned earlier is both a problem and solution for this application. A problem since we often have source geodata containing many more than 1000 features. But we will never need more than 1000 features visible at any one time to edit, plus more than 1000 feature layer features will degrade the performance of the mobile application; zoom and pan will become increasingly more challenging. So what is our best compromise? In this case id we have more 1000 features and an ArcGIS server instance, we publish the full dataset to server, BUT only publish a subset of this data in ArcGIS Online. This subset would be the extent of the data published, so the area and features being edited that day or by that group of field workers. There are many potential applications of this technology in disaster management and assessment. Mobile apps such a the one described will prove important to local and state governments, the insurance industry and other key sectors and organisations. For more information about our work in this area contact us at info@webmapsolutions.com. This entry was posted on Friday, March 1st, 2013 at 1:52 pm. You can follow any responses to this entry through the RSS 2.0 feed. You can leave a response, or trackback from your own site.